With only a few minutes left of the year 2010, I can look back at a dramatic year for both the site and for me personally. As usual, I will not write any long summary of the year that has passed. But at this time of the year I always sit down and think about what has happened and how I feel about it, as well as what I could (and in some cases, should) have done differently. And this may be a good time to write a bit more about the plans for next year. On the personal level, 2010 started with chaos and worries. But thanks to good friends, a healthy amount of optimism and a significant amount of acceptance for the fact that I needed to go through a rough time before things could get better, the year slowly moved out of the chaos and into something that would become a fresh restart and an exciting adventure. And today I feel better than I have in many years after coming out on the other side of the rough period, feeling both refreshed and inspired. Frequent visitors may have noticed this through the re-design of the site, more frequent blog posts and tutorials, new site features, new distribution methods and a number of new templates. In fact, I have released more free templates during the second half of this year than I did in total from 2005 to 2009. There are currently 29 free templates in the template gallery, along with 24 alternate versions. A year ago, I was living with my fiancée Johanna in a small two-room apartment where my workspace was a 1,5 x 1,5 meter corner in the apartment kitchen. My main computer was an old and unstable laptop, and updates to this site were quite rare and sporadic. I did spend a lot of time answering general questions and support requests over e-mail and trying to inspire others, but I didn’t really have any inspiration, motivation or structure for building and publishing new material. Today, I am writing this post using a high-performance desktop computer in my own home office, a separate room dedicated for work in the house we moved to in October. This site is now my full-time job, and I love it. Beside being truly happy that I am able to work with something that I am really interested in, it feels great to be able to help people all over the world building their own websites. There are millions of websites that use template designs (or themes based on them) from andreasviklund.com, and the number is growing every day. Needless to say, that is a major source of both inspiration and happiness. I have also upgraded from an old and basic Nokia phone to an iPhone 4, which allows me to work in a completely different way when I am away from home. I can upgrade the website, post entries, edit images and even update the HTML and CSS in the free website templates directly in the phone. And of course tweet, post messages on the official Facebook page for this site and read and reply to e-mails – all things that I were not able to do away from home before. I am also able to customize mobile versions of the free templates for Mobile Safari in iOS 4, something that has been requested a number of times. In terms of software, I am now equipped with Adobe Photoshop and Dreamweaver CS5, so from now on I will be able to publish .PSD resources along with the templates, as well as testing the templates with Dreamweaver. A few days ago, I added a mobile version of this site which customizes the design for small screens and touch navigation for visitors who use smartphones and other mobile devices. I considered building an own solution, but after trying the WPtouch Pro plugin for WordPress, I found it to be a better all-in-one solution for this site than what I would be able to create by myself. The “Pro” part means that andreasviklund.com use the commercial version of the plugin, which has a number of additional options. A free version is also available, and it is well worth checking out if you run a self-hosted WordPress blog that you want to make more useful for mobile readers. 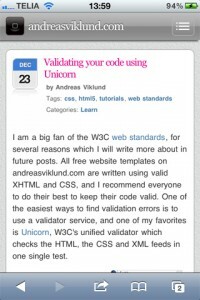 Thanks to WPtouch Pro, andreasviklund.com can now be used as a webapp on iOS devices. I still have some settings and design elements to tweak during the next couple of days, but so far it seems to work well. If you use a mobile device but prefer to see the normal site, that is of course also possible thanks to a theme switch link in the footer of the mobile site. Feedback for the mobile site would be very welcome, please let me know what you think if you have tested it. The priorities for next year will be to continue releasing free resources, and to add tools and services that will make it even easier to build high-quality websites using website templates as the starting point. There are several exciting projects in progress that will be presented in the beginning of next year, including adding different kinds of material by other designers. I am still searching for template designers and CMS theme designers who want to share their work through this site and provide CMS-specific ports of the templates for different content management systems and blog engines. Theme/template designers who would want to convert the free templates for Joomla, WordPress, Drupal, MODx, Frog, EE, Blogger, Tumblr and other systems and services are very welcome to contact me for more info. Starting tomorrow, it will also be possible to advertise on the site (banner space, no text link ads) through BuySellAds.com, something that has been requested for a long time. More about that in a future post. The site will expand with a few new sections in 2011, as additional resources related to web design and site-building will be added. Stock images for headers and backgrounds (based on my own design work and own photos), graphics design tutorials, more HTML/CSS tutorials, WordPress themes and some really exciting tools and services (both free and commercial) are among the things that you will see during the year. Thanks to the new phone, I am now able to use Twitter and Facebook in more ways during work away from home. I have tried a number of useful and interesting external services which I may connect to the site and use in the future, as well as some more ordinary services like YouTube if I would get into video tutorials and screencasts in the future. Beside work, I have also made a new-year resolution to start recording music again, and release the music for free on the web. Starting a personal blog (or rather a typical and uninteresting diary) in Swedish is another plan, since I love to write. But those two things are not high priorities, and neither one will have anything to do with this website. 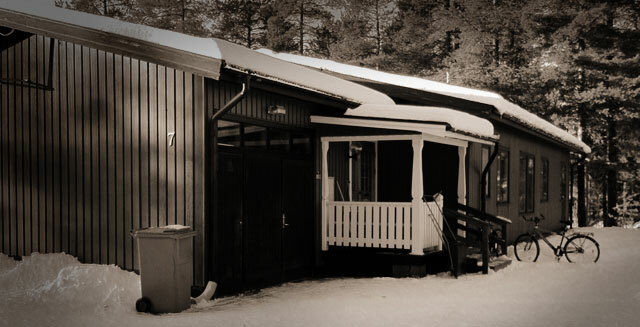 As for writing related to my work, I may possibly start writing articles in Swedish about web design and building/running websites for a larger Swedish site. Nothing is decided about that, but it would be a nice challenge. To end this post, I would like to send out a big and warm “Thank you!” to all of you who have supported me throughout the years. I wish you all the very best for the upcoming new year, and I hope that you will continue to follow this site and my work in the future as well. Greetings from the snowy north of Sweden, where I am not off to take care of our dogs (including two cute Papillon puppies, 12 weeks old! ), to keep their attention away from the loud and scary fireworks that will soon launch all around our house in a few minutes. Happy New Year Andreas and am stoked to see how things have evolved for you as you totally deserve it! It looks great expectations for the year 2011. I hope all your dreams come true, and know that always has thousands of fans who want the best for you. Very happy to see you gettin back to work . Your templates and designs are mind blowing and at the same time they are fast loading and minimal . You really deserve what you have earned !! Looking good. Just wanted to stop by and say thank you for all your good work and posts here. They’ve really helped me out alot.